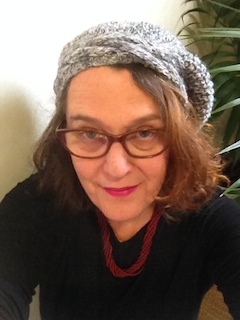 I bought a beret on Saturday that is going to change my life – or at least my blog! I don’t think I could have bought that beret if I had not attended the Thought Leaders business school Open Day on Thursday. My mentor in the thought leadership program is Yamini Naidu and today, my whole content marketing practice is entirely built on just a fraction of what I learned through Yamini’s inspiring and practical mentoring. Yamini offered me the opportunity to attend the open day. I’m so glad she did. The keynote speaker was a motivational speaker who hates motivational speakers: Jason Fox. He was excellent. Also there were the Thought Leadership founders, Matt Church and Peter Cook. I’d never met Matt, but the few minutes we spoke together are part of the train of events that lead to the beret-buying, life-changing moment. I told Matt about my content marketing practice. “Everyone here is your market,” he responded. I said I was keen to establish the training and mentoring side of my practice – and the hurdle was that everyone simply asked me to “do it for them”. Oh no, he replied. It’s so important that they do it themselves. That’s a sentiment I share and have written about on this blog in the past, but I guess his comment really reminded me how important this part of what I offer is to me. Usually, when I buy a hat, I never wear it, because I feel too … is it vulnerable? Or is it just that I feel too “me” – too different. Certainly, seeing Jason Fox speak helped me step into the world of hats (my beret is my learner’s hat; I intend to go much further into hat world). Jason, who is a red-head, wears a Ned Kelly-style beard and is quite an individual guy in all ways, including his ideas on how to motivation works. It was Jason, who among his many valuable insights on how to stay motivated, and why we don’t, suggested having a word that encapsulates the year ahead. We turned to our neighbours to discuss our word. I had no idea. Until I bought my beret and put it on my head two days later. And then I realised my word: it is Spirit. Hats represent ‘spirit’ to me – fun, humour, individuality and energy. Spirit is what I want to nurture in myself and in everyone I work with, and this is why. To work in a spirited way is, for me, similar to working with passion but with humour and self-confidence added to the mix. I’ve always thought applying the word passion to work was wrong – passion is what you feel for your lover. It’s intimate and personal. But spirit is right. Spirit is being able to respond energetically but without rancour to adversity, to criticism and to the possibilities of the moment. Spirit also has a social meaning: in the spirit of co-operation, or “school spirit”, which is the example provided by the great and very-much-underappreciated resource, Wikipedia. Co-operatively is the way I want to work, and wish for everyone else in the working world. Wikipedia taught me something else fabulous about the word spirit – it comes from the Latin for breath, also meaning soul, courage, and vigour. Oh, yes! That is my word! To engender spirit is my personal and professional goal, without a doubt. Spirit, and my beret, also remind me of gypsies: at their best, a wild, romantic, free-spirited people and at their worst, outcast and corrupted by poverty. I associate gypsies with music and dancing too, which are both incredibly important to my spirit. I met a wonderful gypsy in Belgrade a few years ago while on holidays. He played a worn guitar handed down over generations and sang heart-wrenching gypsy songs in Serbian, which the dear friend I was travelling with, a native Serbian speaker, précised for me. We got talking with him. His wife was a graphic designer. (Not all gypsies live up to stereotypes .) He told us about how he had met her, and how they traversed the hard times in their relationship. He sang songs directly at our table, which I loved. As if they were just for us. Our spirits can make us soar, but spirit has a dark side. I’m thinking here those high-octane alcoholic spirits that can take hold of some people and drag them into a vortex of self-destruction. Or the high-spiritedness that can be a barrier to listening, humility and learning. So we must temper our spirit as well as nurture it, I think, and that makes the whole process a creative one. Expect to read more about spirit, and hats, as I unleash my “hat spirit” and follow it where ever it takes me. There were a hundred or more email pitches sitting in Caitlin Fitzsimmons’ inbox this morning – and she’s going to read them.